A mother and son have been sentenced to six months imprisonment suspended for two years after pleading guilty to keeping 84 cattle in 'horrific circumstances'. 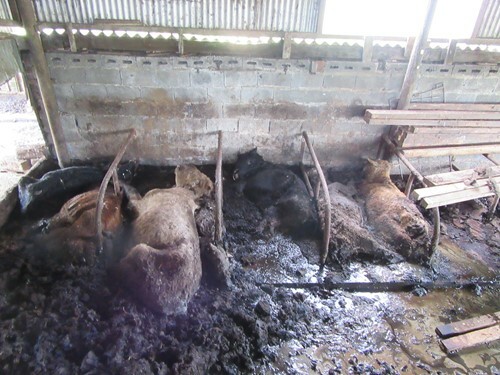 Margaret Cooper, 80, and Norman Cooper, 55, of Gilfachwith Farm, Bangor Teifi, were sentenced in relation to the death and serious neglect of dozens of cattle. A sentencing hearing was held on 10 April at Aberystwyth Magistrates Court to consider the guilty pleas submitted by the pair. The prosecution follows an investigation by Ceredigion County Council, who visited the farm in May 2018 together with officials from the Animal and Plant Health Agency (APHA). Officers recalled how they encountered scenes of 'utter devastation' with dead cattle decaying in the livestock sheds. There were surviving cattle housed with these carcasses, and found to be suffering unnecessarily from neglect. The vet confirmed that the cattle were being caused unnecessary suffering, and the decision was made to take the remaining live cattle into the possession of the council to prevent any further suffering. Some animals had to be dispatched following examination, due to the serious health conditions they had developed as a result of their suffering. Ceredigion County Council's Alun Williams said that most of the staff involved in the case are from farming backgrounds and they faced 'horrific circumstances' in investigating and retrieving the live animals and the carcasses. “The Animal Health Officers involved with this case have never experienced such appalling conditions at any farm in their careers,” he said. “This case does not reflect the usual high standards of animal husbandry that is the norm in the two and a half thousand farms in Ceredigion. In sentencing, the Chair of the Magistrates said: “This was a horrendous case, as you know. We believe that your actions led to the sustained neglect of these animals, in that they were not provided with basic care needs, food, water, and bedding; dying tied to their stalls. “There is clear evidence they have suffered over a long period of time. Also carcasses of those that had died were mixed in with those that were living, it was horrendous”. The pair were sentenced to six months imprisonment suspended for two years, and disqualified from keeping any animals for ten years, with the only exception is that they are allowed to keep their four elderly dogs for the duration of the dogs lives. Mr Cooper was also ordered to undertake 150 hours of unpaid work. They were ordered to pay costs to the Council of £2,500 each, with a victim surcharge of £115 each.